Recently the Los Angeles 2020 Commission released a report on the current state of the City of Los Angeles. A lot of people have dissed the report, and I have some gripes with it myself, but for the most part there’s no disputing the conclusions they came up with. This city’s a mess. Sure, we can say some of the commission members are pushing their own agenda, and sure, I have some problems with their process. But still, the problems they point out are real. This city’s in deep trouble. The report details the crises we’re facing on several fronts, but it points out two areas that I think are particularly important, and closely related. First, our elected officials are sadly lacking when it comes to demonstrating leadership. Second, voter turnout for elections is appallingly low. In the last mayoral election, only twenty three percent of registered voters went to the polls. Mayor Eric Garcetti was elected by less than thirteen percent of registered voters. I will confess up front that I did not cast a ballot. Ordinarily I make it a point to vote in every election, but I was so demoralized by the prospect of choosing between Wendy Gruel and Eric Garcetti that I couldn’t bring myself to do it. Obviously part of the reason for the low turnout was that most Angelenos, like me, were completely underwhelmed by the candidates. We had to choose between two long-time insiders who had no new ideas, no imagination, no vision. The only real difference was that Garcetti was backed by developers and Gruel was backed by the unions. The campaigns they ran let us know that their highest priority was preserving the status quo. And that won’t work any more. LA is facing several serious challenges. The budget is locked into chronic deficits, our water supply is seriously compromised, response times for emergency services are sub-standard, the city’s infrastructure is crumbling. We can’t afford to stick with business as usual. While Garcetti and Gruel were the front-runners, there were several other candidates on the primary ballot, and some of them had interesting ideas about how to address these issues. I know many of you will say, ‘But the other candidates didn’t have a chance. It was either Gruel ort Garcetti.’ And this is the kind of thinking that has gotten us into the situation we’re in now. As long as we keep voting for the same hacks, we keep perpetuating the status quo. City Hall is controlled by a group of powerful insiders who are beholden to another group of powerful special interests, mainly developers and unions. It’s the political insiders who get the money to mount high-profile campaigns, and when they get into office they keep perpetuating the same cycle of patronage and corruption. As long as we keep accepting the same old hacks, over and over again, refusing to look in new directions, refusing to think outside the box, the city will continue to be run by the same pack of losers that got us into this mess to begin with. Maintaining the status quo is not an option. If we don’t change course, we will slide into the abyss. We need to find new leadership. We need elected officials who will actually face up to the problems, instead of looking for a way to slide around them. And the only way that’s going to happen is if we get engaged. We need to be informed. We need to be involved. We need to vote. Just because the city’s budget situation isn’t as dire this year as it was last year, don’t fool yourself. LA is sliding off a cliff, and our elected officials aren’t going to do anything unless we make them do it. The photo at the top is from the Los Angeles Public Library photo archive. 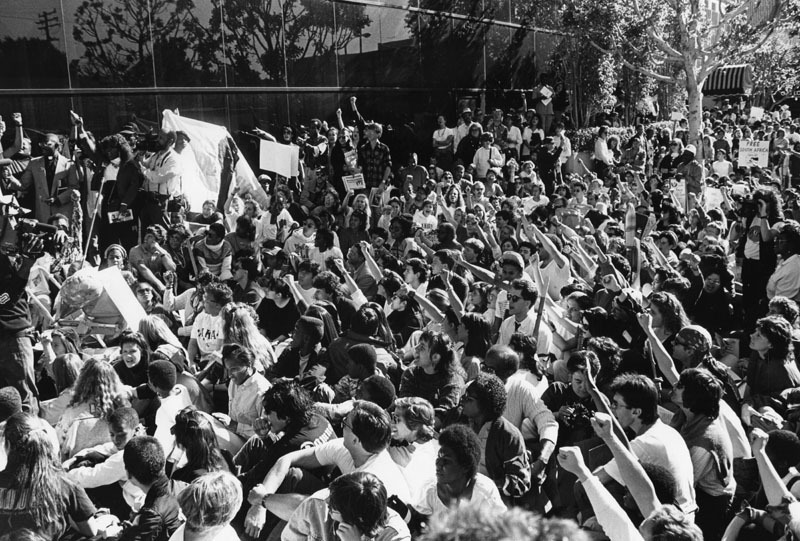 It shows an anti-apartheid protest, and was taken by Chris Gulker in 1989. 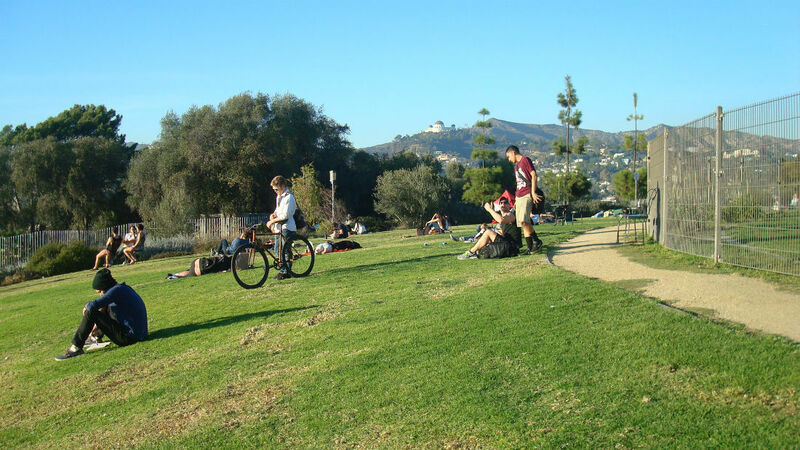 Late afternoon in Barnsdall Park. Years ago I used to live on Edgemont between Hollywood and Sunset. 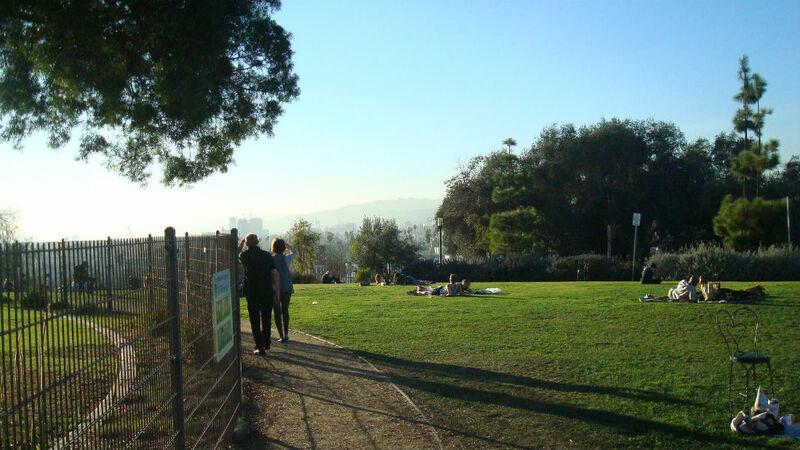 One of the great things about the neighborhood was that Barnsdall Park was right across the street. I used to go there fairly often, but then I moved away, and Barnsdall kind of fell off my radar. I’ve been meaning to go back for years, and this last weekend I finally made the trip. 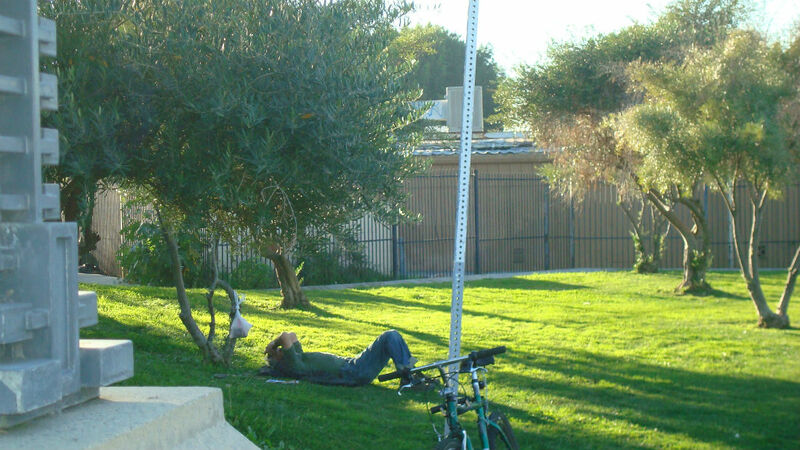 A cyclist resting at the base of the hill. There are lots of parks in urban areas, but somehow Barnsdall seems different. I think this is mostly because it sits on top of a hill. As you climb the stairs, the sounds of the city, the traffic, the sirens, the helicopters, all seem to fade into the background. Then you get to the top and there are these amazing panoramic views of Los Angeles. 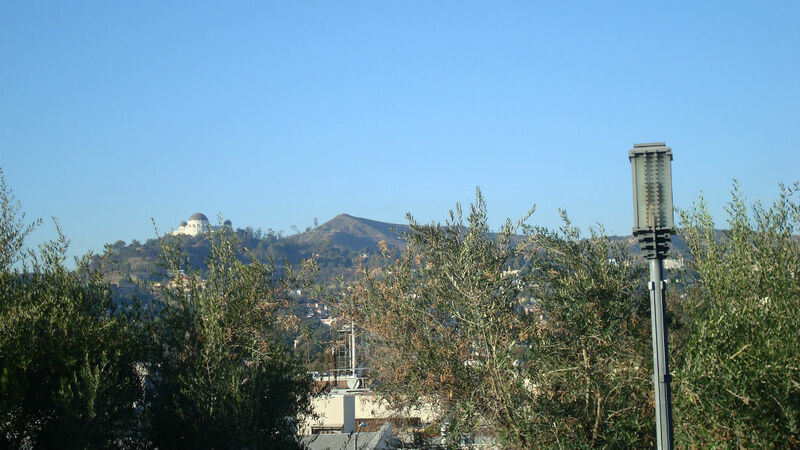 The Griffith Observatory is perched on the hills opposite Barnsdall Park. Another reason the park is special is that it’s home to Frank Lloyd Wright’s Hollyhock House. Completed in nineteen twenty three, this was Wright’s first project in Los Angeles. I’ve only been inside once, but the memory has stayed with me. The house is beautiful and unique. Unfortunately, it’s closed right now for restoration. 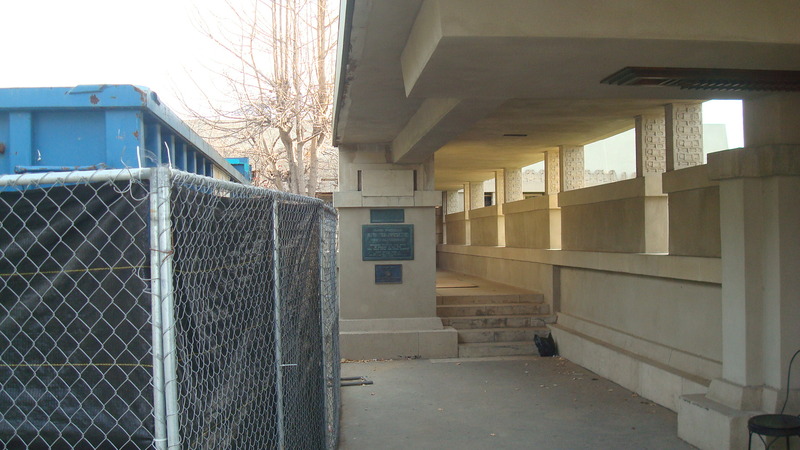 The entrance to Hollyhock House. 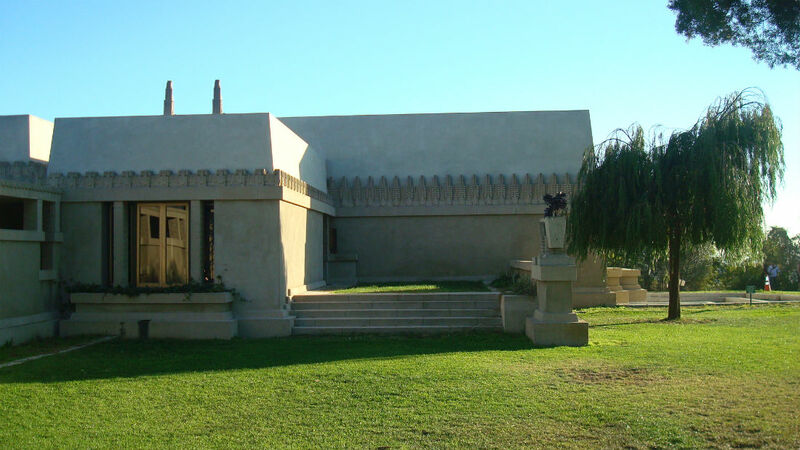 The west end of Hollyhock House. We have the park thanks to the generosity of Aline Barnsdall, who donated it to the city back in the twenties. Originally from Pennsylvania, Barnsdall wanted to create a theatrical community on what was then known as Olive Hill. 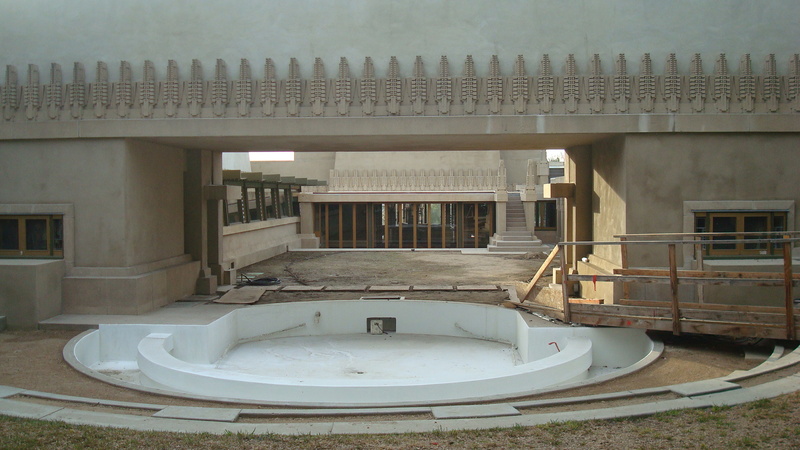 She commissioned Wright to design Hollyhock House, as well as several other structures, but the two parted ways and the complete plan was never realized. The Municipal Art Gallery at Barnsdall Park. 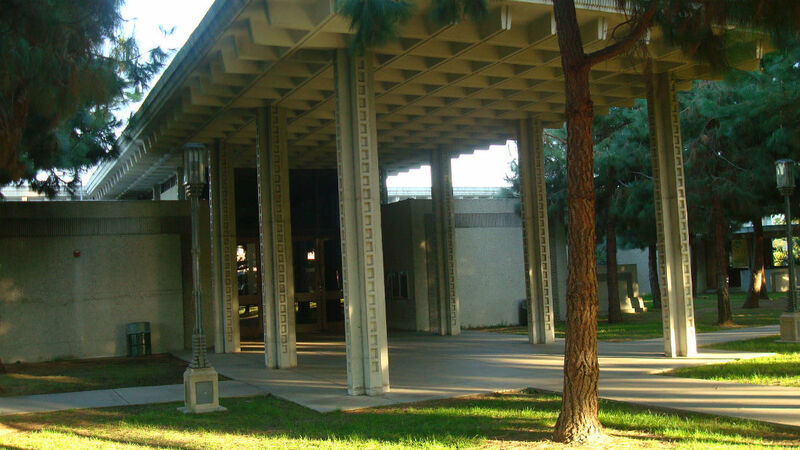 Barnsdall Park is also home to the Municipal Art Gallery and the Junior Arts Center. For more information on the programs offered, follow the link below. People on the grass at the western edge of the park. LA will be changing dramatically in this new year. We’re going to see a wave of construction that will transform the city, for better or worse. The mayor and the city council are decidedly pro-development. They will tell you it’s because they’re looking to the future and trying to create jobs. It might also have something to do with the massive amount of campaign cash that local politicians have received from developers. But I don’t want to be totally negative. Development is necessary. And change can be good. It’s the beginning of the new year. Let’s try to accentuate the positive. Downtown will definitely be getting more dense. A wave of construction is hitting Downtown LA. There are a staggering number of projects in the works, and the landscape is going to change considerably. For an overview, check out this summary in the Downtown News. The project I’m most excited about is The Broad. The building looks cool, the collection is impressive and admission will be free. What more could you ask for? A link to the site is below, but like the building, it’s still under construction. More cranes on the horizon for Hollywood? 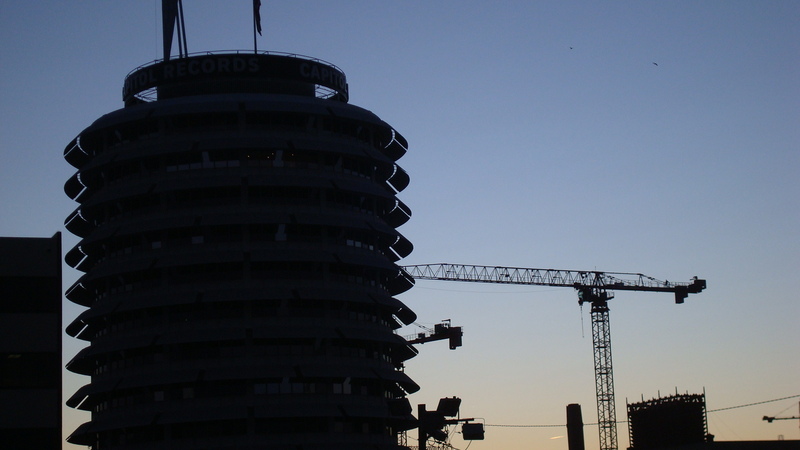 These huge cranes have become a familiar sight in Hollywood. There are a number of buildings going up right now, and many more in the works. Under construction at the moment are Blvd 6200, Columbia Square, Emerson College, and a ton of new residential and retail space on La Brea. But the projects that may have the most significant impact are the expansions planned by Paramount and Universal Studios. I know Universal isn’t located in Hollywood, but their “Evolution Plan” will certainly impact the Hollywood area, both in terms of jobs and traffic. Click on the link for more info. Next is a link to an article in the New York Times which talks about both the Paramount and Universal projects. An image of Santa Monica back when it was less crowded and less expensive. The picture you see above doesn’t represent Santa Monica as it is today. It shows the Santa Monica I knew when I was growing up, a sleepy, laid back community where rent was cheap and traffic was light. But those days are gone. While the residents staunchly supported a slow growth policy thirty years ago, today the city council is enthusiastically pro-development. There have been some complaints from locals, but that hasn’t stopped the council from approving a slew of projects. The first article, from the LA Times, is an overview. The second, from The Architect’s Newspaper, is about a group that wants the council to slow down. 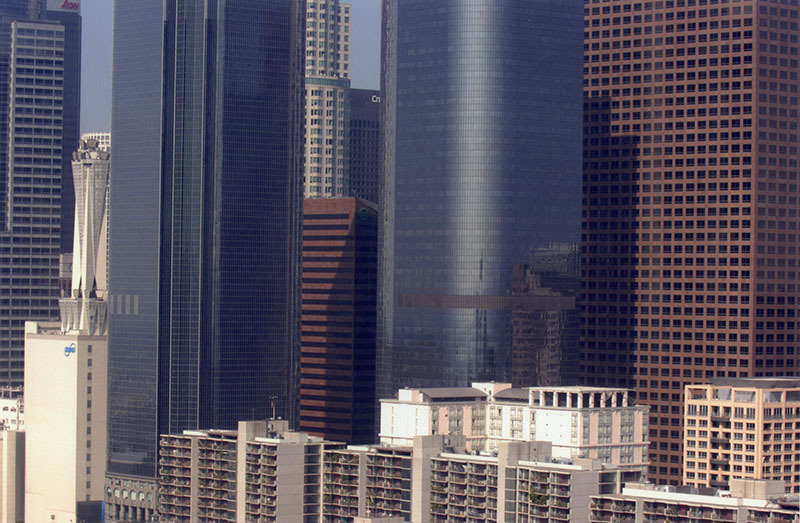 The photo of skyscrapers on Bunker Hill is by Gary Leonard, and comes from the Los Angeles Public Library’s on-line archive. The image of Hollywood was taken by me. 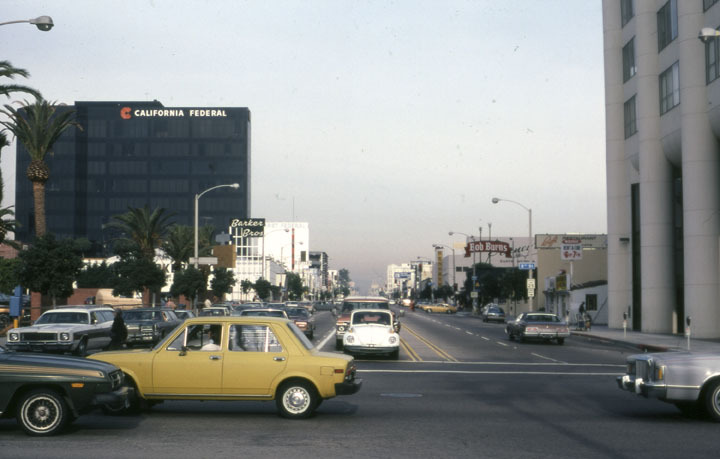 The photo of Santa Monica was taken by Anne Laskey, and also comes from the LAPL archive.